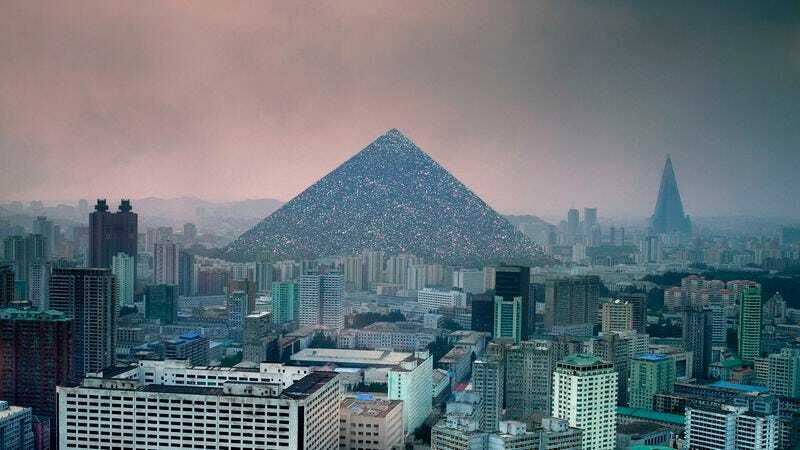 PYONGYANG—In an effort to relieve his boredom and fill an otherwise uneventful afternoon, North Korean leader Kim Jong-un stacked all 24 million of his country’s inhabitants into a human pyramid Friday to help him pass the time. “Do the pyramid faster and taller,” the North Korean dictator ordered from a balcony overlooking Kim Il-sung Square, as 800,000 of his citizens clambered to reach the 47th tier of the massive gymnastic formation and steady themselves on the trembling backs of millions more of their countrymen. “I want it taller than that. Have the labor camps been emptied? We can add prisoners from the labor camps. Move faster! Ugh, this human pyramid is more dull than no human pyramid at all.” At press time, Kim had left to take a nap, but ordered the pyramid to remain indefinitely in case he got bored again and wanted to play around with it some other time.